In the summer of 2012, three families got together with the goal of creating the best pizza restaurant in Charlotte, NC. We wanted a restaurant that not only served the best pizza but also one that would be known for its service and community involvement. In our quest to create the “best” pizza, we traveled from New York to San Francisco, from New Haven to Los Angeles, and virtually everywhere in between in search of the perfect pizza. We learned that making exceptional pizza requires special skills, passion and commitment. At TRUE Crafted Pizza we take an artisan’s approach to making pizza. We begin with the finest ingredients and craft them together to create imaginative pies with simple yet distinctive flavors and textures. No two pies are the same shape or size and each is an individual expression of our expertly trained Pizzaiolos. With help from Harry Peemoeller, a renowned baker/professor at Johnson & Wales University, we developed a flavorful and truly unique pizza dough. Our Pizza is unlike anything else you’ve ever tried. Traditional Oven Baked Pizzas: These crispy crust pizzas are cooked to order in our high temperature wood stone oven and delivered to the guests within 5 minutes. Signature Grilled Pizzas: Unique to TRUE Crafted Pizza this style is not offered anywhere else in Charlotte. These pizzas are thin crust pies that have been brushed with olive oil, grilled to perfection, and topped with the freshest ingredients possible. The combination of the dry heat and the smokiness of the grill make for a memorable pizza. In addition to the pizzas, our menu features a selection of handcrafted sandwiches, freshly tossed salads, tempting appetizers, and locally-made gelato. TRUE Crafted Pizza is a modified fast casual restaurant concept where guests order at the counter, are free to choose a table and food is brought to them. Beer and wine can be ordered in the same manner or directly at the bar. 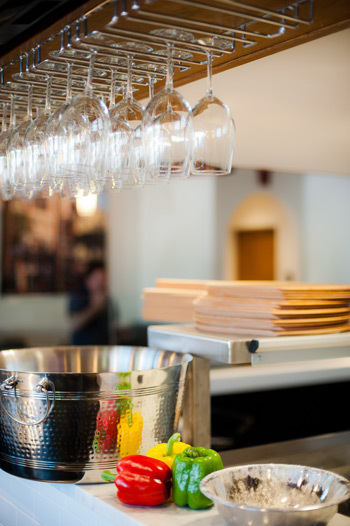 Our bar offers a extensive selection of locally crafted beer and a wonderful list of Italian and Domestic wines to complement our menu. Our knowledgeable bartenders will gladly guide guests through our beer & wine lists and our menu. We strive to be TRUE to the ideals of quality, consistency, and community. Our quality stems from the simple and skillful preparation of the finest ingredients. Consistency comes from an uncompromising commitment to producing the best product, and our promise to the community is to provide unwavering support to local schools, churches and community organizations. Come taste for yourself what a TRUE Crafted Pizza is and you’ll never think of pizza the same way. We look forward to serving you soon. with news, promotions and events!